Doctor Strange - Sorcerer Supreme is based on the Marvel Comics character Doctor Strange and re-introduces the viewer to this classic comic book character in an easy to understand format. When the highly acclaimed specialist, Dr. Stephen Strange witnesses an inconceivable and unexplainable "supernatural" event, he is left baffled and disturbed. To compound the mystery for Strange, he encounters a girl who is plagued by nightmares with unexplainable brain scans. After leaving the hospital, he once again witnesses strange supernatural images which causes a devastating accident that leaves him unable to practice. 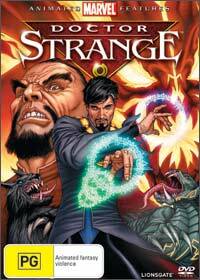 On the verge of suicide, Strange is approached by a mysterious individual who urges our hero to visit Tibet where our hero is initiated into the sacred arts of sorcery and becomes the new Sorcerer Supreme of Earth. As comics make their way onto DVD, Doctor Strange Sorcerer Supreme is an extremely well made piece of art with amazing choreography, believable characters and an engaging story that will be enjoyed by fans and lovers of science fiction and fantasy genre. Presented in 16:9 widescreen with Dolby Digital 5.1 (also available on Blu-Ray), Doctor Strange - Sorcerer Supreme is a first class video and audio experience with vivid colours and quality animation. The special features have some great background information on the character from a featurette to concept art. This DVD is the perfect introduction to any viewer, even if they have no comic experience what so ever or the comic fan! * First Look at "Avengers Reborn"